Every child wants to know how life begins and where they came from. Where did I come from? Who am I? How did I start? This cheerful and clear book makes it easy to start talking about different ways of becoming a family. The entertaining story covers the issues surrounding fertilisation without over-emphasising the point. Pontus the Penguin Goes Visiting is a reference book skilfully disguised as a picture book, designed for all families. The story naturally takes the reader from one family to the next as Pontus, the nursery’s soft toy penguin, goes home for the evening with one child in turn. First he visits Kirsikka, then Ilona, Kauri and Malviina. The story amusingly and simply explains how all of them were made in a way that small listeners can easily understand. Along the way we learn about in vitro fertilisation, egg and sperm donation, a two-mum family and adoption. At the end of the book there is an information section aimed at the grown-ups with expert advice on how to go about telling children about where they came from. 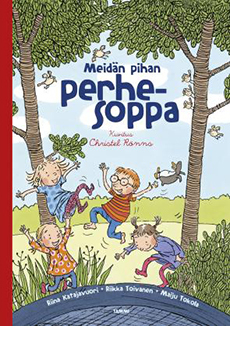 The team behind the book comprises two psychologists and psychotherapists, Maiju Tokola and Riikka Toivanen, author Riina Katajavuori and illustrator Christel Rönns.